I'm new to this site, and I finally decided to make a campaign . Wanted to make a campaign a long time ago, but didn't have some coherent story . . . and now I have it! It will be a 5 mission Terran/Protoss campaign, set after the defeat of the Overmind, and the beggining of the Brood Wars (Protoss IV). I'm using the Starcraft X-tra Editor for the maps, so there won't be any exotic new units . . . just plain SC The maps will be jungle/badlands mostly, and 2 installation maps. Will try to make new sounds for existing units and heroes, there will be extensive briefings, and maybe even music (if I get the rights to use it, or maybe I'll find some free music that fits). After the fall of the Overmind, the Protoss rallyed their forces and started evacuating from Aiur. As an elite commander of Raynor's Raiders, your team is sent to the remote Protoss colony of Telh'Pirha, a moon orbiting D-427, an icy planet under Emperor Mengsk's Dominion control. The Protoss presence on the moon went unnoticed for a long time, because of it's strange orbiting pattern: one side is always faced away from the planet's surface. The Zerg have layed siege to this system too, and both the Dominion and the Protoss had a hard time fighting them off. Luckily, with the defeat of the Overmind, the Zerg fell into disarray and the Protoss were able to protect themselves. However, the Protoss discovered some strange radiation emanating from the Dominion's outposts. Observers scouting the areas recorded Zerg units under direct command of the Dominion's psychic units. 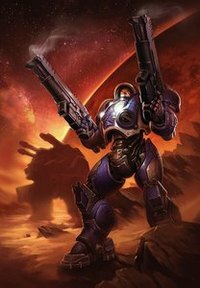 Raynor sent your team on this mission with the purpose of evacuating the Protoss survivors to their new homeworld. Faced with the threat of dominion controlled Zerg, you must also discover any Dominion technology that allows control over the Zerg units, and destroy it. I will post an update no later than tomorrow about the heroes of this campaign. Thanks for applying to the contest, off, looking forward to your project. And now, I present you the heroes of this story! A young templar, Thor'Elas is known among his brethren as a fiery, raging zealot. The invasion of his homeworld only deepend his hatred and rage. Having already passed half the training needed to become a High Templar, he abandoned it. The loss of many of his friend made him lose faith in the Templar caste, unable to provide protection against the incoming slaughter of the Zerg. He didn't believe in their ways. He had lost faith in his own abilities. He cast aside his Templar training and turned back to the primal rage that drives zealots into the heat of battle. He believes that is the way to face the Zerg... head first . Although always outnumbered, he always surpasses his opponents in both power and damage. In other words, throughout the story he will develop a special ability (done with triggers, a lot of them ) that enables him to divert attention from himself: two hallucinations of him, serving as bait while he delivers the real damage. A passive ability, it can only be cast when he is overwhelmed by enemies (there is a sufficient number of foes in his vicinity). Sent by Raynor, Sam is the commander in charge of the men sent to evacuate the Protoss colony. He always keeps his cool, no matter how bad the situation is and is known for cracking a few jokes now and then An experienced fighter and marshall, he leads his men by example. His reinforced power armor gives him additional protection in the thick of the firefight, and he's one hell of a shot with the Gauss rifle. It wouldn't be a contest then, would it? I vote a big no. No. But theres no reason you shouldn't upload what you have and continue improving it after the deadline. Ya just put at the end of the campaign "Not Finished". Obviously, the answer is no considering I'm replying at 11:14 PM, but this would of still stayed no as the contest was extended months already to begin with to attempt to attract others. But trust me, one amazing map can overpower a dozen cheap maps.